I’m happy to announce that yesterday our team released a new premium product — the Capitalist, a brand new collection of modern flat icons. We hope you’ll appreciate the unique style and big variety of the set. You can take a closer look to the set here. We set a nice discount for al Dribbblers, just offer code dribbble15 while purchasing to activate it. 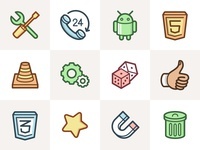 These icons created in collaboration with @saenko, and we are really grateful for her participation.